Yes, you will have leftover corned beef. Yes, you could chop it up, fry it in a skillet, and make Irish tacos out of it. Yes, you could shred it and combine with hash browns. But we suggest something different, such as one of these creative suggestions from working chefs (we’ll be experimenting with the corned beef powdered sugar this weekend, this much is certain). We’ve definitely made tacos out of it. We’ve made croquettes out of it. At our bakery, we do a Sri Lankan-style curried corned beef that we put in a bun. It’s got sautéed onions, jalapeños, mustard seeds, turmeric, and curry leaves, with coconut milk and lime juice. That’ll also go great with rice and eggs. The other possibility is to make a potato gratin with flavors of a reuben. I’d take my potatoes, cabbage, carrots, with caramelized onions, and cook it in a cast-iron skillet. If I have boiling liquid, take that and make a velouté out of that. Then add swiss cheese and turn that into a fondue, shred in corned beef, and pour it over the potatoes, carrots, and cabbage. Sprinkle some rye bread crumbs and throw that in an oven. Serve it with mustard or thousand island dressing. We have a dish on the menu that uses hangar meat scrap, where we take the meat, pressure cook it, then leave it in shreds. That’s the base of our beef jerky dish we serve during happy hour. I’ll be doing the same with corned beef leftovers. We’ll freeze a nice big chunk of it, then slice on a meat slicer, then dehydrate for four hours to make corned beef chips. You should treat it like a short rib. If you have mash left over, I would add some caramelized onions, and maybe brussels sprouts instead of cabbage, then add a poached egg on top. That to me would be comfort food. You can do chilaquiles with leftover corned beef. Make a salsa verde with tomatillo with lots of lime and cilantro. Then, take cabbage and carrots and cook that down with oil, almost like an Irish sofrito. Then we’ll add in the shredded corned beef and maybe add some cumin. Then we’ll add a nice big pile of crispy tortillas chips and some beer cheese on top, then bake it. I like to make a thick tempura batter and fold in my braised cabbage. I fry dollops of cabbage and batter to essentially create a fritter. 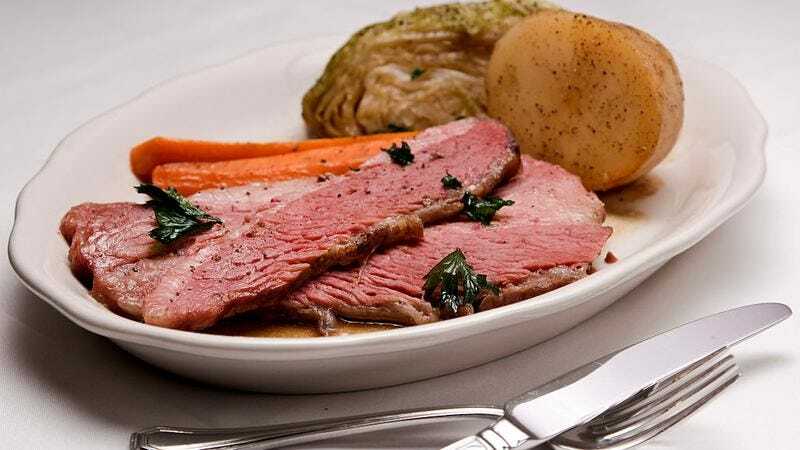 l toss some re-heated and shredded corned beef with the cabbage fritters and make a quick, creamy whole-grain mustard sauce that I drizzle over the dish. Adding a fried element usually helps with the St. Patrick’s Day hangover. A fried egg is also a nice addition. Utilizing the saltiness of the corned beef, combined with a variety of late winter and early spring vegetables, I like to create a veggie-forward “hash.” Typically my corned beef ratio is much less than the vegetables, so it’s just enough to add that meaty and salty goodness that vegetables lend themselves very well to. I poach an egg and drizzle a bit of herb and citrus-infused olive oil over the dish to brighten everything up and add a bit of well-deserved acidity. It’s simple and delicious. Disclaimer: This one is kind of weird but it works. If the corned beef has been in the fridge for a few days, I leave the last bits uncovered and let the cold air in the fridge dry them out. If you still have some moist shreds, you can aggressively fry them until crisp. I look for a texture that is a bit dryer than beef jerky, with almost zero moisture left. I put the crispy shreds in a spice grinder and get them to a powder consistency. I add the corned beef powder to sugar and let it sit for a few hours. The sugar and corned beef harmonize well together, and then I use the sugar to dust some homemade donuts, make a caramel sauce, use in chocolate chip cookies, or any preparation where salty and sweet is what I’m shooting for. Last St. Paddy’s day, my wife and I had leftover corned beef and we made corned beef blinis—potato pancakes. We cook the potatoes and push it through a tamis, then mix it with eggs and flour. You can then shred or rough chop the corned beef and fold it into the batter. Cook it just like you would pancakes, lightly oiled in a skillet. At the same time, I’ll roast spring onions with olive oil, salt, and pepper in an oven. I’ll top those over the blinis and put a big dollop of sour cream on top. The taco has always been the household favorite because it’s easy to do. I’d use cabbage and some citrus to make a light coleslaw, and make a dipping sauce from Guinness. You can also make corned beef and cabbage quesadilla, or a smile hash and put it over a bagel or English muffin and a sunny side-up egg and melted fontina on top. The Irish hot pocket is starting to come around too. Go to your local supermarket, buy some puff pastry or phyllo dough. Take some leftover cabbage and shred it fine, roll it with a little cheese and corned beef. Put that filling in the dough—roll it, pinch it, crimp it, bake them off at 325 degrees Fahrenheit for 15 to 20 minutes. The hearty one is to take a bit of boiling liquid, mix it with chicken stock, then add the potatoes, cabbage, carrot, corned beef, maybe some fresh herbs, and make corned beef soup. Some like it with Irish soda bread and a nice shot of Jameson.